Another BBB edition which I'm hosting, yay!! Please bake along with us! Instructions on the bottom of the page. Lengthy post with the recipe and the pictures so I'll try to keep this sweet and short just like the bread! 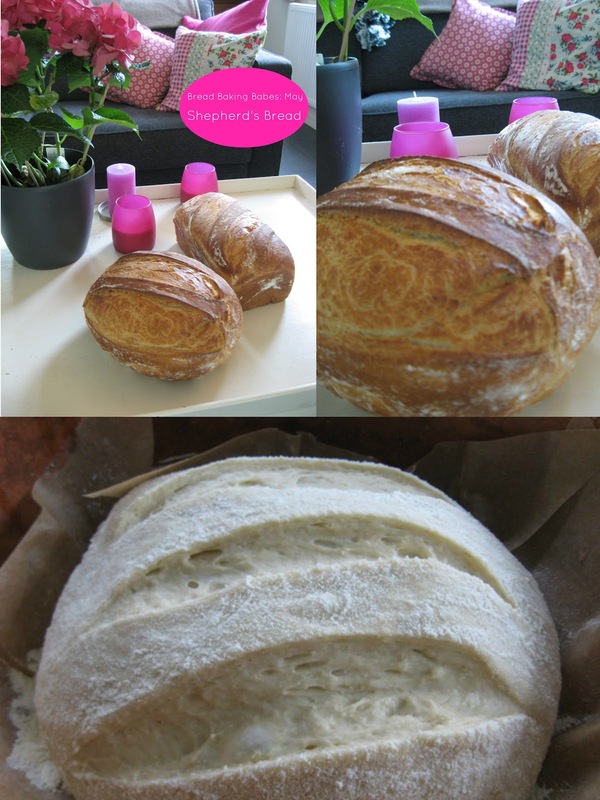 Though I have to add: this is seriously good looking very good tasting bread! We are baking not as much a novel recipe instead we -or at least I- am revisiting a method which I really like but can cause some discussion or frustration.... Baking in a cloche! Discussion because oh horror! we're instructed to put a COLD cloche in a hot oven. There has been a lot of talk about putting that dry and cold earthenware pot in a preheated hot oven. I know you’re not supposed to do that. I’ve been doing it every time I bake bread in this thing and there has been no cracks nor explosions. Disclaimer: my pot may not be your pot and no, I won’t replace yours if/when something unspeakable happens. I’m not sure but I think wetting the inside of the cover may help preventing cracks?? Discussion over? Frustration because arrgghhh we're instructed to heavily flour the cloche..... I'm using my mom's old Römertopf. The inside is so smooth and there's this pesky indentation in the bottom both of which will cause my loaf to stick no matter what or how. So I'll use parchment. Bye Bye screwdriver to get my bread out. Now with that out of the way let's go on to the recipe! "Traditionally baked in a cast-iron pan submerged in a small, ember-lined pit covered with dirt. It is easily adopted to conventional home ovens by baking it in a contemporary clay cloche, a cast iron Dutch oven with a tight fitting flanged lid, or on a pizza stone. 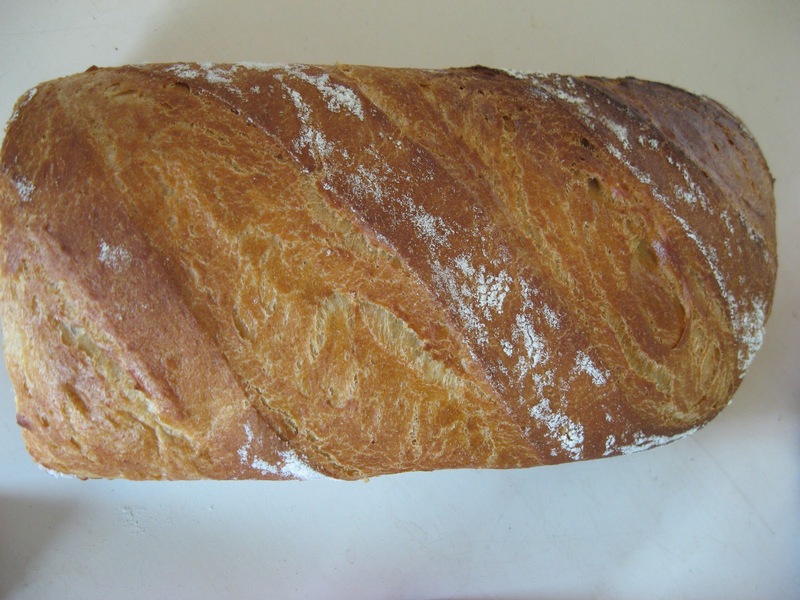 This Basque bread is a relative of the simple Spanish and Greek peasant loaves of Europe. For a ww version, substitute an equal amount of ww grain for the 2 cups flour in the sponge and 1.1/2 cups ww for an equal amount in the dough, making a slighty denser finished loaf. Eat this bread the same day it is made." 1. 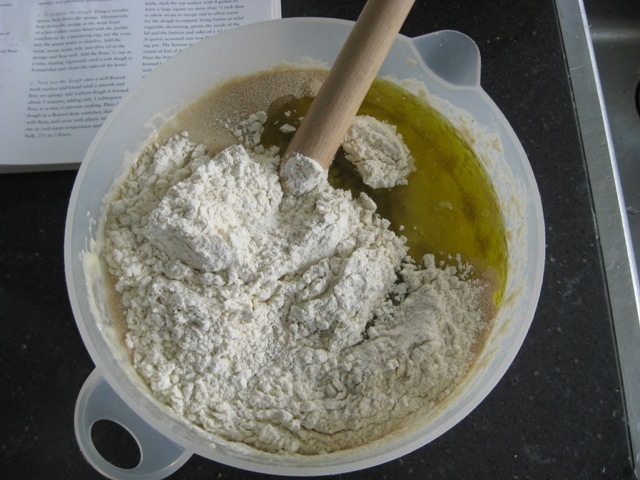 Prepare the sponge: In a large bowl sprinkle the dry yeast or crumble the fresh yeast over the tepid water, Using a large whisk add 1 cup of the flour and the sugar. Add remaining cup of flour and beat hard until very smooth, 2 minutes. Scrape down the sides of the bowl and cover with plastic wrap. Let stand at room temp until soft, spongy and pleasantly fermented, 2 hours. 2. Prepare the dough: Using a wooden spoon, beat down the sponge. Alternatively, beat down the sponge in the work bowl of a stand mixer fitted with the paddle attachment. In a measuring cup, stir the yeast into the warm water to dissolve. Add the yeast, warm water, salt and olive oil to the sponge and beat well. Add the flour, 1/2 cup at a time, beating vigorously until a soft dough is formed that just clears the sides of the bowl. 3. Turn out the dough onto a floured work surface and knead about 5 minutes until a smooth dough is formed. Will be firm yet springy and resilient. Adding only 1 tbs flour at a time to prevent sticking. Place the dough in a floured deep container, dust the top with flour, and cover with plastic wrap. Let rise at cool room temp until tripled in bulk, 2.1/2 - 3 hours. 4. Shaping: Again turn out the dough on a clean surface. It will be slightly sticky from the long rise. Knead in about 1/4 cup more flour to make a firmer dough, about 1 minute. Shape into a tight round ball. 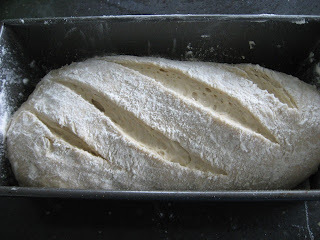 Pull the ends tightly to the center of the loaf to form a smooth bottom and sides. Mist the surface with water. Using about 2 tbs of flour, heavily coat the top surface. Using a serrated knife, slash the top surface decoratively, no more than 1/4 inch deep to allow steam to escape and to allow room for the dough to expand. Cover with the cloche dome/bell and let rest at room temp 15 minutes. Before placing in the oven, rinse the inside of the cloche bell -cover/lid- with water, draining off excess drips. Place back over the bread and place in the preheated 425F oven. Bake 10 minutes. Lower thermostat to 400F and bake a further 25-35 minutes. Remove the bell after 30 minutes of baking to allow the loaf to brown thoroughly. Remove and cool at least 15 minutes before serving. - My notes on how much flour I used are in green next to the recipe. - Sticky dough warning! Don't be tempted to add too much flour. This is a sticky dough but not slack, it will form a nice round when pulled tight to shape your boule. - Thought; play around with the sugar content. Beth uses quite a lot. I baked one using 45 grams, another one with 90 grams. Surely the latter was sweeter but surprisingly enough not overly so. My preference would be the 45 grams. 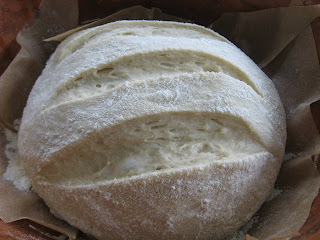 - Thought: I baked this recipe using all white flour. Baked it using rye and white in the starter (Great starter!). Another one using amaranth in the starter ánd the final dough. Yum! So basically what I would like to say is that this is a very versatile recipe. When you keep an eye on the balance you'll most likely can get away with a lot of substituing. 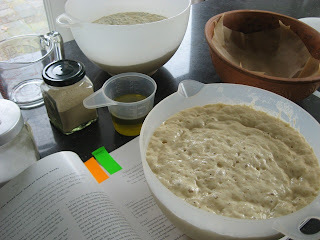 - This would be a fun dough to make a bbq bread; add some ground pepper and garlic to the dough and snip in loads of herbs. Then roll jelly roll fashion with some raw onion and cheese inside and bake in a loafpan. Or fold the dough around and make a boule for baking in the cloche. - Best eaten the same day.... which is no problem at all! The quart I had left made beautiful toast. After reading this (and see the bread in it's full glory *cough*) you really do want to bake along don't you? Please do so, you will not regret it. 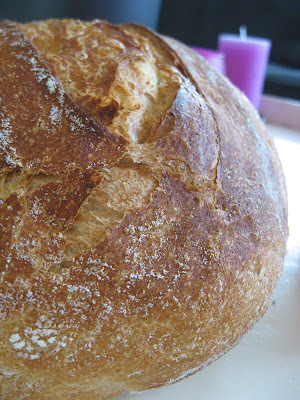 Make some pics and share your thoughts about this month’s bread on your blog. I will be more than happy to add you to the BBB Buddy round up on May 29th and send you your Buddy Badge. If you do not own a blog you can also post your picture to Flickr or any other photo sharing site and share your thoughts there. However do send me an email that you want to be included in the roundup and a link to where your thoughts about this bread are to be found! What IS this Buddy thing? The Bread Baking Babes are a closed group but we thought it would be fun to reward people who take the effort of baking our breads with us and give them a nice Buddy Badge and mention in a round up post every month. Just to say thank you for baking along and sharing your thoughts with us. Don't forget to visit my fellow Bread Baking Babes to see how they baked and also... visit our Katie! She is the BBBBB (Bitchin’ Bread Baking Babe Bibliothécaire) who writes up such lovely round ups of all the BBB Breads every month! Yay! I had such fun baking in my cast-iron pot this month. (Maybe one day I'll get a clay baker too.) Delicious bread that my husband and son couldn't get enough of! Beautiful loaves Karen. Glad I was warned and used baking parchment on the bottom, mine came out easy. THanks for pulling out of my seat and make me bake in the schlemmertopf for the first time (and the last time too!). You can read it LATER (!) in my post, hopefully I can get it on tonight. So badly orgnanised. Oh boy Lien... did you need powertools? I hope not! Hmm talk about badly organised; I send a textmessage to my friend congratulating her on her first day in the new job.. a day after the fact! Still thought it was Monday while it was Tuesday already. Yep. I love baking bread and yours looks mouth watering delicious! 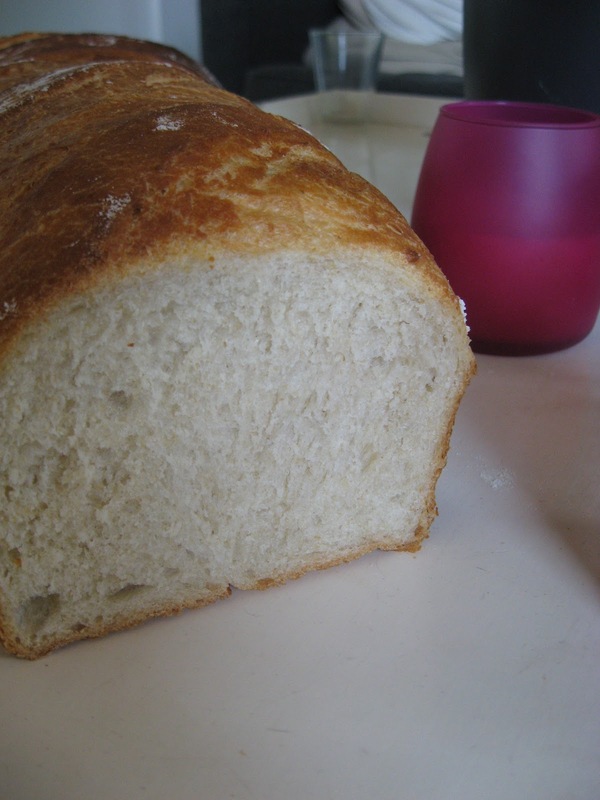 My sons have grown up eating homemade bread and love it every bit as much as I do. 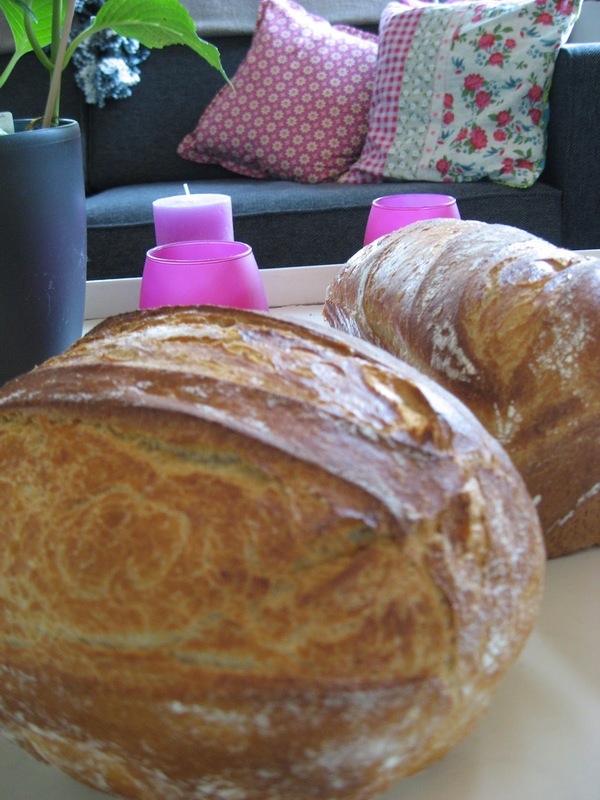 The smell of bread baking, says "Home" to me. Both loaves look wonderful. Great crumb too. Would you believe me if I told you I just bought a copy of the book you baked from? If I wasn't crazy busy at work, I'd totally bake this one with you. Btw, thanks for your insight on my failed Ciabatta. I'll have to try it again. This was an eye opener. Steam in the oven, steam in the pot = RISE! And it's such good bread. Took my 2nd loaf from the freezer yesterday and the crowd went wild for the sandwiches this afternoon. Really enjoyed this one. Rats. I'm sorry to see the sideways winky face after the promise to send the ember pit instructions. I'm still quite curious. Because wouldn't it be cool to bake this bread at the beach (if we ever WENT to the beach) for a clambake and cornroasting party? Are the instructions very very complex? Meanwhile... burn a wood, charcoal, or combination fire until you have a good supply of coals. Sweep the coals into a shallow depression in the ground dug next to the fire, saving some larger coals. Set the pot on a grill or balance it on three stnes 1/2 inch above a ring of 6 to 8 evenly spaces hot coals. Using a short handled shovel, set 12 to 16 of the larger coals directly on the pot lid around the edges and in the middle for even heat distribution from the top as well as the bottom of the pot. Check the bread after 35 minutes; keep in mind that the handle will be very hot. Use a pair of pliers or a poker to lift the lid. Bake, fanning the coals periodically, until the bread is golden brown, crisp and sounds hollow when tapped, 45 minutes to 1 hour. Using heavy gloves move the Dutch oven from the cooking site by carrying it by its wire bail. Use a whisk broom to sweep the ashes off the lid if necessary. I hope you'll invite me for that clam bake on the beach?? Thank you!! Of course, you're invited. As soon as I can find an easy way to bicycle from this land-locked city to a decent beach to dig clams. But surely, it's not just for me, Karen! I bet there are buddies galore who want to try baking the bread this way too. Hi Karen, your bread looks wonderful. I'm doing the sponge right now following your instructions. Is it just me that is missing the 2 cups of water in the recipe instructions? Thank you so much for correcting. Hi, I've sent you a message on your private email and cancelled this one. Who wants "double" mail? Still can't get over how gorgeously crusty those turn out! Thanks, this a simple but grandiose recipe. - and the activ dry yeast I changed for fresh one.